Hello and welcome to the free lesson portion of our monthly e-mail newsletter. I could not be more excited about this month’s tune. When I first learned “Salt Creek” I truly could not get it out of my head -- I fell asleep and woke up humming the first two bars over and over. 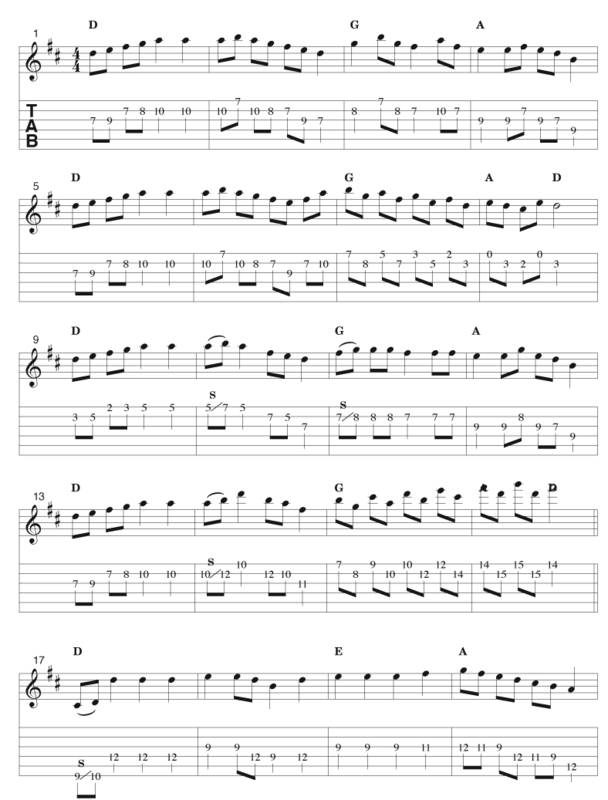 The tune does have an infectious melody with really neat chord changes and, if by some chance, this tune is not in your repertoire then stop reading this and start learning this here tune! “Salt Creek” has perhaps emerged, even more than “Blackberry Blossom” and “Black Mt. Rag,” as the ultimate flatpicking standard. The melody falls quite nicely on the guitar neck (especially with the capo on the second fret), and the tune’s bluesy groove leaves a lot of room to create cool bluegrass breaks. To coincide with this month’s release of the new Tony Rice biography Still Inside (available at www.flatpickingmercantile.com), I’ve selected to present this tune with a few Tony Rice style licks thrown in here and there. Tony Rice recorded “Salt Creek” on his release entitled Guitar back in 1970, and since then he has attached himself to this melody. It seems to be well suited toward his style of guitar playing. To this day, Tony still jams out on this tune and always seems to come up with something new and exciting. In my lesson I have supplied two versions of the tune. The first version is a fairly straight forward version of the melody. It is a combination of many versions that I have been exposed to through the years. In the second version I tried to stick to the melody while incorporation Tony Rice style runs and licks. I, of course, do not play like Tony Rice! The second break is not really intended to be learned from beginning to end. Feel free to do so, but, to me, I feel this kind of solo is more of a collage of Tony Rice ideas mixed with some melody phrases. 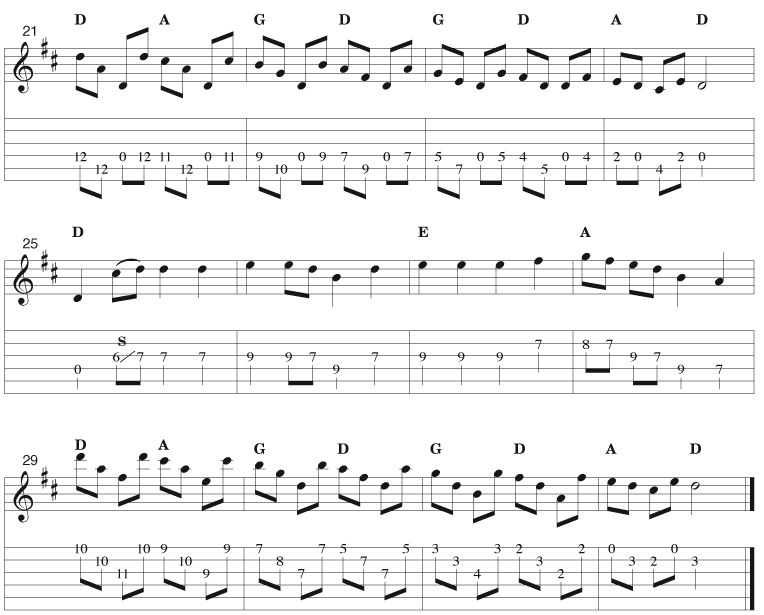 I recommend to isolate some of your favorite runs in the solo and try to incorporate them into your own playing. In the “Whiskey Before Breakfast” example that follows, I’ve used a different type of harmonized scales at the end of each of the A and B parts. 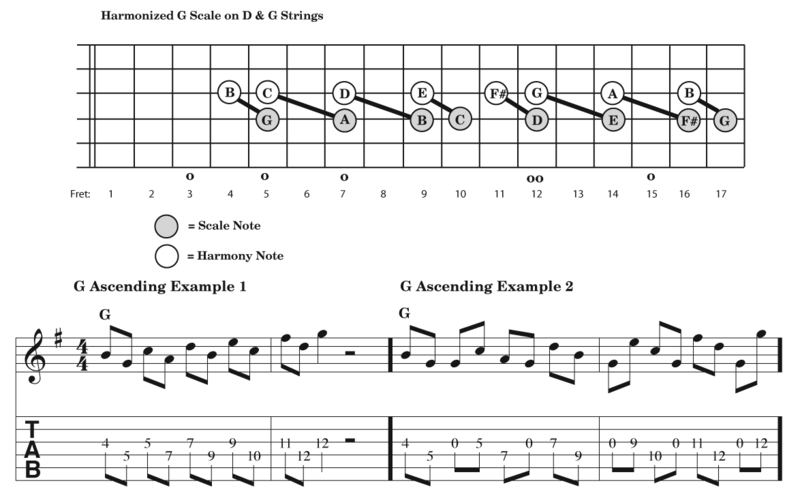 In measure 7 I used a descending harmonized scale to move from the 10th fret down to the 3rd fret. In measures 15 and 16 I used an ascending harmonized scale to move from the 7th fret up to the 15th fret. In measures 21 through 24 I used a descending harmonized scale in conjunction with a D note drone. Finally, in measures 29 through 32 I used a three note harmonized scale (chords) to move from the 10th fret down to the 3rd fret.